We left Orlando on an Emirates 777 and fourteen hours later, arrived in Dubai. We had upgraded to Business Class, which was very pleasant, but still very tiring! We had less than 24 hours in Dubai and we were actually rather tired after our flight. The jet lag didn't help. 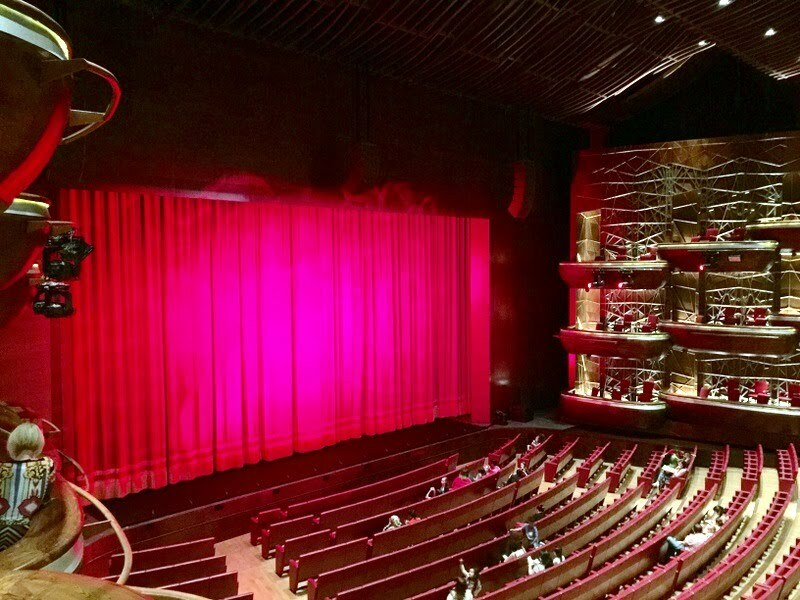 However, we wanted to see the brand new Dubai Opera House and we had bought tickets in advance for the performance that night, The Nutcracker on Ice - very Christmasy in a Muslim country! The Opera House, on the right, is just in front of the Burj Khalifa, still the tallest building in the world. There's a lot of construction going on in the area, so the Opera House is hard to reach at the moment. The exterior is "OK" but the interior is very impressive. All brand new and very pretty, although not many stage lights yet ! So the actual show (The Nutcracker on Ice, as I mentioned) wasn't terribly impressive and we were both feeling the effects of the flight, so we left during the interval and went back to our hotel for a long afternoon nap. We didn't go out again and next day headed back the airport for our flight to Perth. We arrived in Perth at about 1:30 am and by the time we made to the hotel, it was 3:00 am and by the time we got to bed, 4:00 am, so the night was almost over. We slept in, but the jet lag kicked in and we were up fairly early and went to see the city. Perth is the biggest city in Western Australia and it's capital. It has an impressive skyline, seen here from the waterfront. As you might guess from this picture, it's also the financial capital of Western Australia. However, many of the older buildings have been preserved, although sometimes only the facade remains. We also took a sightseeing cruise down to Fremantle, which is the port for Perth, but more of Fremantle later ! After two days in Perth, we rented a car and drove about 150 miles south to the Margaret River area of Western Australia. It's a largely rural area, but is well known for it's surfing beaches and wineries. We stayed in the "guest house" of what turned out to be a small farm run by a retired couple. The "river" at the bottom of their property - more a stream, really. The nearest town was Busselton, so that was the first place we visited. Busselton, like many of the small towns we visited, has a quaint, slightly dated feel about it - more 1950's or perhaps 1960's than 21st century. The big tourist attraction at Busselton is the jetty, which has been rebuilt and extended many times. It was originally intended to allow merchant ships to unload and was extended as the boats got bigger and needed deeper water. Now it's used purely for leisure purposes, although small cruise ships do still dock here from time to time. but it wasn't working the day we were there. This area is well known for it's beaches and for surfing. We visited several beaches over the course of the week, but didn't really spend a lot of time ON the beach. and the water was rather cool. Most of the beaches were relatively deserted. The water was very clear, although a bit chilly, at least at this time of year. This is a famous surfing beach and competitions are held here,so there are stands for the spectators. Besides the beaches, the coastline had several dramatic rock outcrops, where the big waves would break. Quite impressive! The area is also known for it's caves, which you can visit. There are four in all, but we decided that one cave, Lake Cave, would be enough. You start your tour by descending a staircase down into a big hole in the ground. Once inside the cave, there is a concrete footpath and the cave is full of water (hence "Lake Cave") which also drips from the ceiling. One evening, we went out for dinner and for reasons not entirely clear, the restaurant and winery shop had an extensive collection of Golliwogs for sale. Kris had a golliwog as a child and couldn't resist buying one, so here he is !! The Margaret River area also boasts several lighthouses, built at the end of the 19th century as the British presence in the area increased and wrecks became more common. Cape Naturaliste lighthouse. We walked around it, but didn't go up. However, THIS lighthouse, Cape Leeuwin lighthouse, we DID climb! And a view of the original lenses and mechanism, built (in Birmingham) when Victoria was still Queen and still working well. OK - the light is now electric instead of paraffin and the mechanism is driven by an electric motor instead of clockwork, but everything else is the same. After leaving the lighthouse, we took the scenic route home and stopped in a beautiful glade of trees. It seemed almost magical and very Tolkienesque. This area is famous for it's wineries and there are lots of them, but we only visited a couple as we rarely enjoyed the wine tasting and felt obliged to buy what seemed like overpriced wine. This was the Xanadu winery. The wine tasting and salesroom are called "The Cellar Door" which may have been rooted in reality once upon a time, but now they are large, well organised spaces, like the one shown below. Busselton airport is a small regional airport with a few commercial flights every week. Sightseeing flights aren't all that uncommon at small airports, but the chance to fly in a restored Gypsy Moth is certainly rare. This aircraft was built in 1942 for the RAAF. The loving wife bids her brave pilot husband goodbye, not sure if he will make it back from the mission. You can see how worried she looks. So I finally get to live out the Biggles fantasy of my childhood. That would have been me! 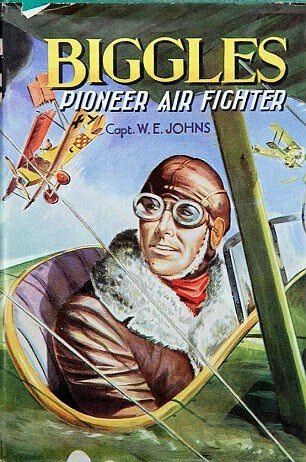 That SHOULD have been me - Dobbo - Pioneer Air Fighter. OK - so he didn't have a radio, or apparently seat belts, but the mindset would be the same. OK - we only flew for 20 minutes and I wasn't exactly flying the plane (I was only a passenger) but it was a great experience anyway. One more item ticked off the bucket list. We drove back towards Perth but stayed this time for three nights in Fremantle, which is the port ser Perth. We stayed in a fall apartment in the center of Fremantle, courtesy of Airbnb. Fremantle is a nice old city, with some elegant buildings from the days when there was a lot of wealth coming into the city. It also has a nice old church, St. John's Anglican church, dating from 1843. Nearer the coast was the Round House, built in 1831 and originally used as a prison for local (as opposed to State) prisoners. The building is significant because it was the first permanent building in the Swan River Colony and is the oldest building still standing in Western Australia. The Round House, nearly demolished many times, but now restored. Nearby is the WA Shipwreck museum, which contains details of the many wrecks which occurred along this coast in the early days of exploration. Because the Dutch East India Company was doing most of the exploring, many of the wrecks are Dutch. The largest display in the museum is of the Batavia, which was wrecked in 1629 on it's maiden voyage to the Dutch East Indies. It is infamous because a small group of the crew mutinied and after the craft was wrecked, killed most of the survivors. A rescue party finally arrived and the mutineers were captured and for the most part, eventually hanged. The wreck was rediscovered in the 1960's and the timbers were salvaged and stabilized before being placed in an iron frame to show the original structure. and would have been installed as shown in Batavia (now Jakarta) if the ship had not been wrecked. Continuing our walking tour of Fremantle, we passed the Fremantle Oval, where cricket (and other sports - note the rugby posts) are played. One of Fremantle's best known attractions is the Fremantle Prison (or Jail) which was built with convict labor between 1851 and 1859. The prison was in continuous use until 1991. Reconstruction of a cell from 1855 - very cramped indeed. After the 1890's the size of the cells was doubled. There was also an Anglican chapel, although in later years, other religions were allowed. The prison was also location of the only place of execution in WA between 1888 and 1984 . Over 43 men and one woman were hanged here during that period. Besides the various historical artifacts, Fremantle also has some nice beaches. We stopped for a drink at Hillary's large shopping center north of Fremantle. (Hillary is a place, not a person). As it is also a marina, it gave us a chance to look at the boats and fantasize about living in the area. On our last night in Fremantle, we went down to the waterfront for dinner and to watch the sunset. Rottnest Island is a small island about 30 minutes away by fast ferry. The island was named by the Dutch, who thought the small mammals they found on the island were giant rats. They are, in fact, small marsupials and are now known as Quokkas. There are thought to be 10,000 on the island. They are very tame and can be seen all over the island, including between your feet when eating outside, although there aren't any here! The island is essentially a National Park and there are no cars or motor vehicles, except those used for maintenance. The lack of traffic persuaded Kris to go on a bike ride for the first time in a long time. We rode part of the way around the island and used the shuttle bus service to see the rest. The big attraction on the island are the pretty, unspoiled beaches. Cape Vlamingh is the western most point and most exposed area of Rottnest Island. There is no solid landmass between this point and Madagascar, 6,436 kilometers away. After two nights on Rottnest, we returned to Fremantle and Perth for one last night in Perth, before leaving by train for Sydney.